Skelmanthorpe Band are pleased to announce that Martin Hall has accepted the role as their new Musical Director. His initial appointment is to lead the band at the forthcoming Brass at the Guild Contest and the Yorkshire Regional Championships on St Magnus. Martin, who is a member of the National Association of Brass Band Conductors, studied cornet under James Shepherd. He has played principal cornet for Wakefield Metropolitan, Knottingley and Drighlington Bands and he has also played deputy tutti-cornet for the Black Dyke Band. In 2010, Martin took up the position of Musical Director with South Milford Brass. 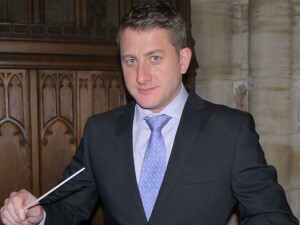 His record includes wins at the North of England Regionals, culminating in Martin becoming the winning Conductor at the second section National Finals of Great Britain in 2012. “I am looking forward to developing a long and successful relationship with Skelmanthorpe” added Martin.